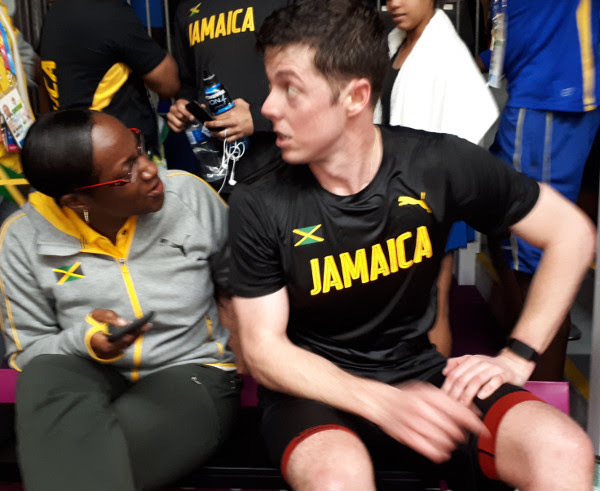 Jamaican team manager Karen Anderson (pictured above with Binnie), who competed in the 2002 and 2006 Games, said: “We’re very excited. He’s working really, really hard and he’s been on the edge so many times. I think it will do the world of good for his confidence. “Lewis beat the No.15 seed this morning – and it was a tough battle. But he held his focus and came back today and won again and so we have two Jamaicans in the last 16! On his surprise run, Walters agreed: “It’s probably one of the best days of my life – it’s got to be up there, for sure! “To win this morning, in terms of beating Peter, it’s probably one of my best wins, rankings-wise, ever, to be honest. And to do it in this event makes me really happy. 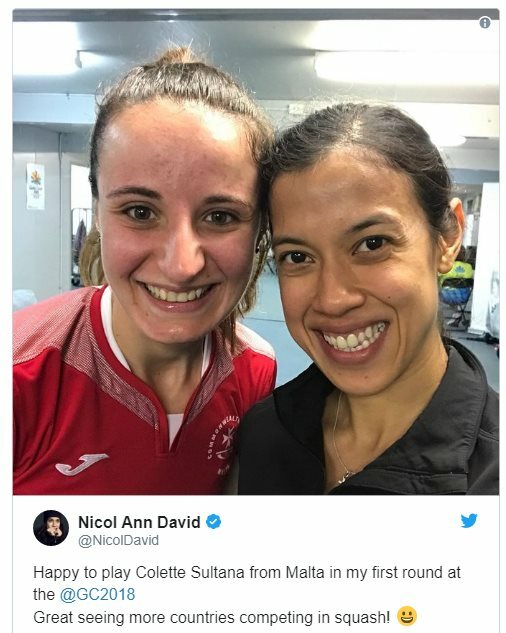 Defending champions Nick Matthew and Nicol David both reached the third round without incident. Englishman Matthew, the men’s gold medallist both in 2010 and 2014, began his 2018 campaign by despatching Ugandan Ian Rukunya 11-2, 11-6, 11-2. The 37-year-old favourite, who plans to retire at the end of this season, will now face Indian Vikram Malhotra, the 16th seed, for a place in the quarter-finals. David is also going for a third successive gold medal. The only player competing in the singles event for the sixth successive time, David overwhelmed Maltese left-hander Colette Sultana 11-1, 11-4, 11-2 in 23 minutes. “It was a good match – it’s always good to see new countries coming to the Commonwealth Games,” said the third seed. 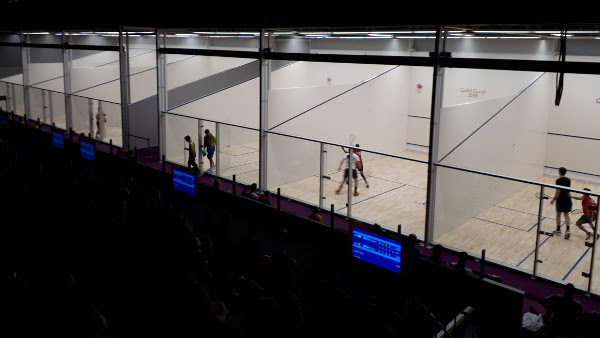 “The set up here is amazing – you can see that the Games has always improved every single time, the venue is amazing and we’ve been looked after really well. “I’ll be playing Samantha Cornett – it’ll be a good match and I’ll definitely have to be sharp from the word go. “It all started for me in 1998 where the opportunity was there for me to participate in this event. We had so much support from the Malaysian government to take squash to the next level and I was lucky enough to keep getting that support from Malaysia up to now. 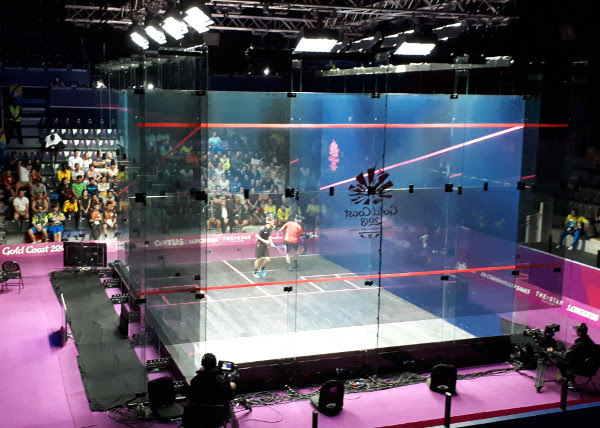 So these Games are really important to Malaysia, for myself – but most importantly for squash being in a multi-sport games like this where the medals are held in the highest regard. So everyone’s going for it! Cornett was the first woman to claim her place in the third round after beating Mary Fung-A-Fat, from Guyana, 11-5, 11-2, 11-4 in 18 minutes. “It feels very good to be the first player through to the last 16,” said the 27-year-old tenth seed from Toronto, one of only two Canadians competing in the 2018 Games. “I know that our guys, and the other women, would love to be here too – but they didn’t qualify. We had to qualify, so Squash Canada sent us to the World Doubles to try and get us in the top five, which was Commonwealth Canada’s criteria. Nikki (Todd) and I finished in fifth place so we are here. One of the event’s biggest prospects is Tesni Evans, the sixth seed from Wales who has enjoyed some major scalps in recent months. The world No.12 from Rhyl beat Guyana’s Taylor Fernandes 11-5, 11-7, 11-3 to earn her place in the last 16 round. On the possible pressure she faces, 25-year-old Evans said: It’s a good thing, I think! Obviously compared to four years ago there’s a lot more pressure and a little bit more expectation – but I still think there are a lot of other people with a lot of pressure on them as well. 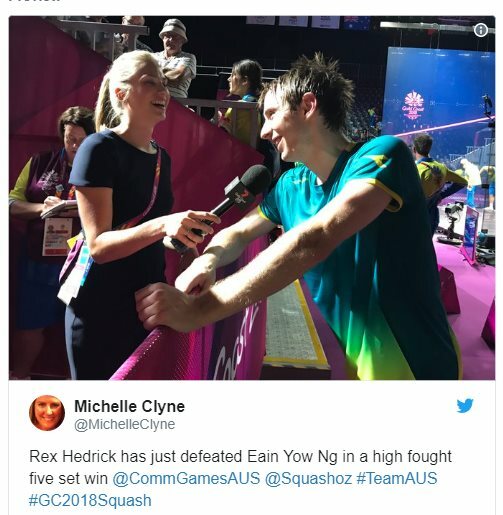 In the longest – and, arguably, most popular – win of the day, Aussie Rex Hedrick upset the form book by overcoming Malaysia’s 13th seed Eain Yow Ng in five dramatic games. At 2/1 down, the unseeded 29-year-old came back to draw level, then saved two match-balls in the decider to beat Ng 13-11, 6-11, 8-11, 11-9, 12-10 in 93 minutes – to rapturous applause from the partisan showcourt (see above) crowd. Ng looked in control at 10-8 up in the fifth, but after an endless rally fell to the ground with apparent cramp in his right leg. Clearly in significant pain and barely able to bend the leg, Ng was unable to respond to the home hero’s remaining attack as Hedrick stormed to victory. Hedrick fully capitalised on this first round win to beat Guyana’s Sunil Seth in the next round to earn himself a third round berth. “It was probably the hardest first round match in the draw,” conceded the Aussie. “He’s a really good player – I’ve got a lot of respect for him.